This would make a great gift to show your friends what it is that you have so much fun doing. Maybe it will encourage them to come along! A 40 min. DVD introducing English Country Dancing. It teaches some of the basic moves found in many English Country dances; explains the structure of the dance; entertains you with information about the history and practice of English country dancing. 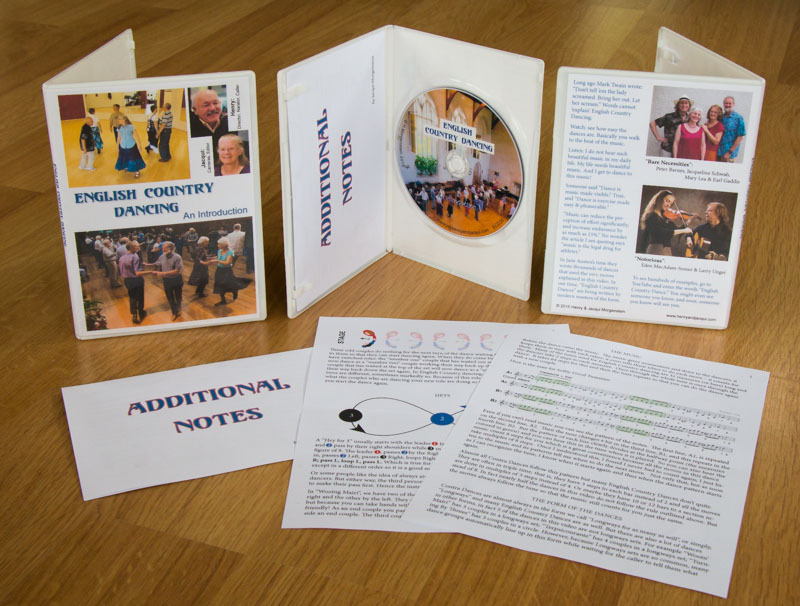 The DVD has a "scene selection" menu so you can easily find the lesson you want to go back to. Henry Morgenstein is the caller and the narrator (voice over). Jacqui Morgenstein did the camera work mostly using a Canon digital SLR recording in full HD. Most of the footage was shot in a great dance studio in Traverse City, Michigan with friends who dance in our back room every week. But two of the dances we teach were in Emmanuel College, Cambridge UK and there are clips from Dartington Hall (also UK) and Pinewoods Camp in Massuchussetts. Many of the dances were done to recorded CDs from the great ECD band, Bare Necessities. The two in Cambridge were to live music by Notorious (Eden MacAdam-Somer and Larry Unger). None of the video was scripted so all the incidents just happened as the result of dancers enjoying themselves. In order to make this as unintimidating as possible to newcomers, we chose to film dancers who are simply people enjoying themselves. We feel that perfect dancing, while admittedly beautiful to watch, may well deter a newcomer from "giving it a go". The fact that some mistakes are made and people recover with good humor should help to give the message that you don't have to be perfect to do this. It is $7.50 plus p&p. (Media mail is $2.61 while we are in the US - May through October.) It is also available from the CDSS book store. Ask me for prices for multiple copies. "I am watching it now and finding it excellent. I think it is a really good approach not only to explaining figures, but also to showing what ECD is and how much fun it is." "Thanks for this! It's great to have a video out there that breaks down the elements of a dance so that a beginner can learn how ECD dance patterns work. The slow motion clips really make it easier to understand what's happening. Cool idea! I really like the overlay of text and hand annotations to explain the dance figures while you're watching the dancers do the moves. Love the inclusion of mistakes too! Plus the dancers are dressed in everyday clothes, and look like a group of friends having a good time, rather than performers. This signals to newcomers that they can come as they are and have fun. "